Break to Devon and Cornwall. owned by the National Trust. 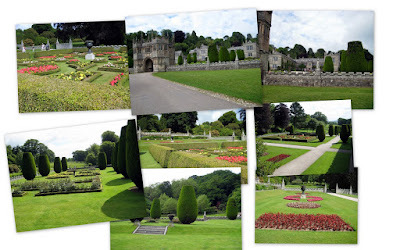 We have recently returned from a few days holiday visiting the South West of England, after promising ourselves we should tour around more in our own country. The picture above is Lanhydrock House, a magnificent Late Victorian country house with extensive servants' quarters , gardens and a wooded estate. There are 50 rooms to explore and the gardens are particularly spectacular, especially at this time of year - we visited in early June. 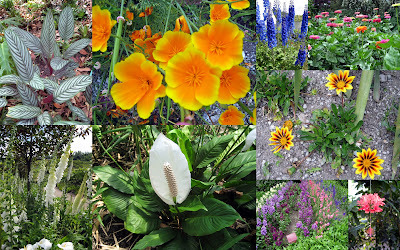 The following photographs were taken at the Eden Project in Cornwall, the plants are just stunning, I particularly loved the gorgeous bright blue ones, sorry but I forgot to make a note of the name, however I am sure there are some plant lovers out there who could enlighten me! We also visited another National Trust property Killerton House in Exeter, Devon where we saw a lovely collection of costumes including a dress worn by Queen Victoria! This was one of the most exciting moments of our visit as I love anything victorian and I particularly love reading about Queen Victoria. I am currently trying to get all my finishes completed before the summer holidays, I am working on a final private exchange that I am hoping to post next week and I am putting the finishing touches to the Christmas in July exchange for the Hooked On Exchanging Too group. I will then be planning and stitching my first anniversary gift for the 31 July and then I will be concentrating on some of my large unfinished projects, including my HAED Gothic Rose here and The Porch Swing by Paula Vaughan (click here for progress picture) as I have been neglecting them lately! Kathy was the winner of the Ladybird Biscornu, I shall be posting that this week. 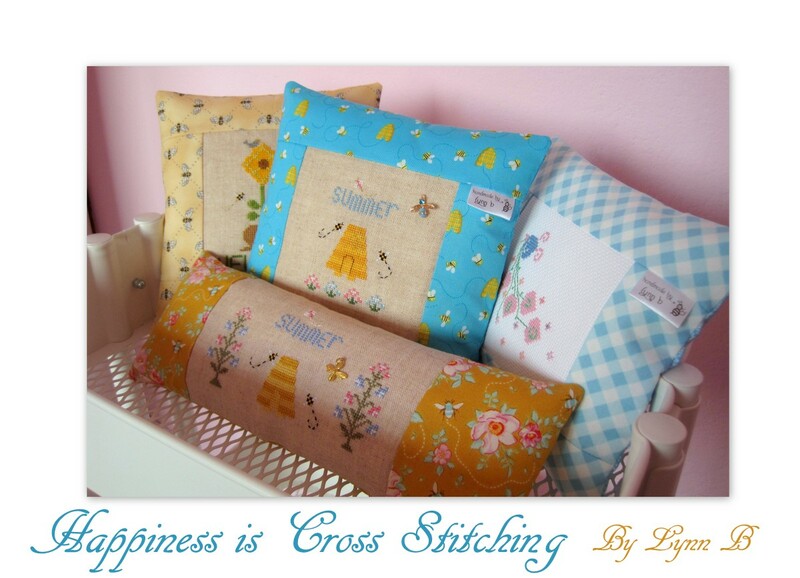 Thankyou for your visit and happy stitching everyone! The winner of the Ladybird Biscornu is.........? I would just like to say thankyou for all the lovely comments I received for the biscornu giveaway, I was thrilled you liked it. Congratulations Kathy, please email me! 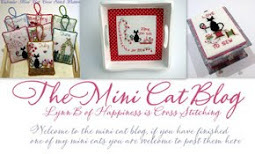 Please remember my blog anniversary on the 31st July, I will be stitching something special ! Happy stitching everyone and thankyou for your visit. I just love biscornu's and I am sure there are a number of fans out there who love them too, so I have decided give away this ladybird biscornu, it is stitched using DMC threads on linen. 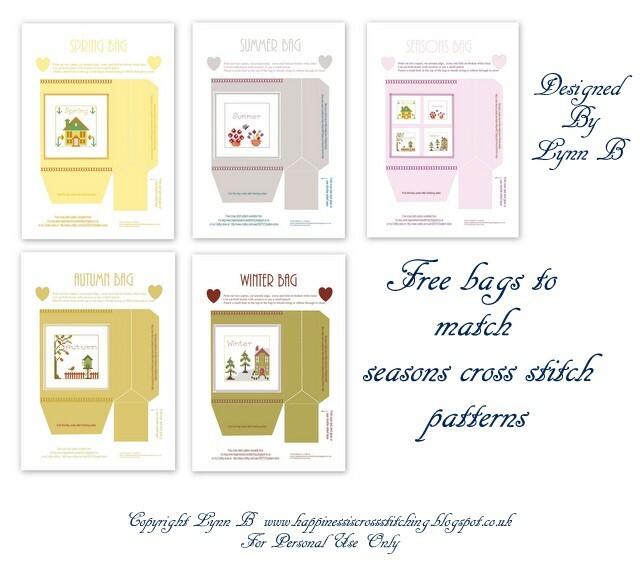 All you need to do is leave a message on this post and tell me what is your favourite finished stitched item on my blog. You are welcome to follow my blog if you think it's worthy, however that is not a pre-condition to win! I may not get access to the computer over the next few days so if your comment does not appear straight away please bear with me, I will access when I can. I will draw the winner on Wednesday evening at 8.00pm GMT time, so don't be late! Edited: I originally asked for visitors to say why they visit my blog but I suppose it's because you like cross stitch, so I decided to change the question! I made the fimo clay rose from a glittery blue colour to match the DMC satin threads. I used a free chart for the alphabet but unfortunately I cannot remember where I got it from, if anyone can help jog my memory I would appreciate it. My friend has since let me know that she loves it! It was a pleasure to stitch this for you Diane. Since posting these pictures I was invited to post on another blog for stitchers books, this blog has some lovely photographs of stitchers books and there are a couple of links that show galleries of photographs, it really is worth checking it out for inspiration - the link is here. Happy stitching everyone and thankyou for your visit! My first hand made quilt is now finished. Here is the picture of my first hand stitched quilt that I promised to show, I started it in 2005 and I have only just got around to finishing it. I usually like quilts made in pastel shades and floral designs but on this occasion I decided to stitch something very bright. 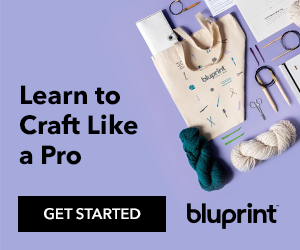 I made this to see if I would like making quilts before I decided to embark on a much larger project, I hope you like it! Edited : A few of you asked me if this is Mary Engelbreit quilt fabric - yes it is. 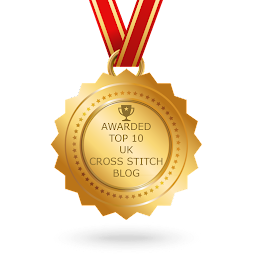 Thankyou for taking part in my poll, the results are displayed at the top, it has helped me decide what to stitch for my blog anniversary in July. Happy stitching and thankyou for your visit!